The Dog of Alcibiades, The Molossus sculpture - This Forum is brought to you by The Mastiff Sweet Spot and Friends of the Forum. It was bought in Rome by British collector of antiquities Henry Constantine Jennings in the 1750s, and is often called The Jennings Dog, but is perhaps better known by the name Jennings gave it, The Dog of Alcibiades. This name connects it to a story about a dog, told by Plutarch, and probably having no real relation to the sculpture. Whatever it's original provenance, nobody denies it is a fabulously important work of art, and was bought by the British Museum for £950,000 in the eighties, and would now be worth much more. But what is it? The British Museum reckons it is a second century A.D. Roman copy of a second century B.C. Ancient Greek bronze depicting a Molossian dog or Mollossus. The Molossian people lived in the mountainous Epirus region of northwestern Greece that was taken over by the Romans in 168 B.C. Their dogs were famous in the Greek/Roman world for their size and courage. 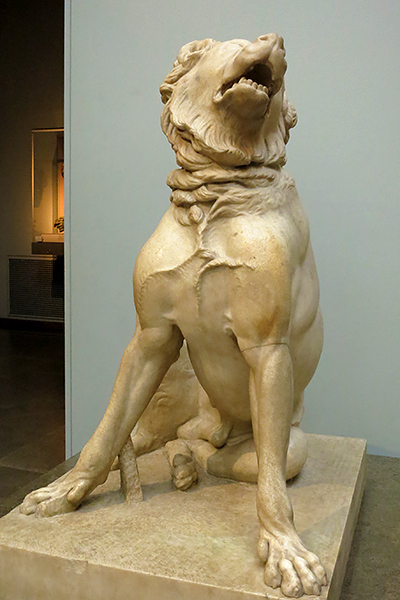 It is quite reasonable that these dogs were associated in England with the Mastiff when this sculpture was widely reproduced after it's arrival in Britain. Gambling debts forced the sale of the sculpture in 1778, when it was purchased by Charles Duncombe. Edmund Burke was said to have remarked at the time, "A thousand guineas! The representation of no animal whatever is worth so much," to which Dr. Samuel Johnson replied, "Sir, it is not the worth of the thing, but the skill in forming it, which is so highly estimated. Every thing that enlarges the sphere of human powers, that shews man he can do what he thought he could not do, is valuable" (Boswell, Life of Samuel Johnson, April 3, 1778). "What if you choose to penetrate even among the Britons? How great your reward, how great your gain beyond any outlays! If you are not bent on looks and deceptive graces (this is the one defect of the British whelps), at any rate when serious work has come, when bravery must be shown, and the impetuous Wargod calls in the utmost hazard, then you could not admire the renowned Molossians so much." So interesting as this sculpture is, it is much easier to connect it to the flock guardian breeds of the mountains of Europe than to the English Mastiff. After searching several sources the closest match I can find is the picture on page 115 of Yann Arthus-Bertrand's book, titled "Dogs". It shows a good example of Greater Swiss Herder Dog. The feet match, elongated structure and this dog has the shorter coat. This allowing the muscular build to show, as in the sculpture. It is still missing the heavier coat around the neck. The ears, muzzle and heavy neck coat match Yugoslavian Herder, but they have the heavy coat all over. And their foot structure doesn't match. Very cool sculpture. Thank you for sharing it. We use DNA panel testing on our mastiffs that not only covers disorders and diseases but also 10 coat colors, patterns and types as well as 5 morphological traits. One of our male mastiffs had an interesting result regarding furnishings in his coat type, which the test describes as " hair on head, face and lower legs". There are two loci associated with this trait, and our boy is homozygous for no furnishings on one locus but heterozygous on the other to carry furnishings (GG/GT). I have seen this result on two other mastiffs, all of our other tested dogs are homozygous for no furnishings on one locus and homozygous for furnishings on the other (GG/TT). A dog would need to be homozygous on both loci for furnishings in order to express them (AA/TT), so it appears that only 1-2 of 4 of these alleles are appearing in the modern mastiffs. All three of the mastiffs that carry this trait are from very different bloodlines, so not connected in that way. Our boy does not carry the long coat gene; this locus is separate from the long-coat gene so I wonder if the furnishings are carried forward from ancient dogs like the The Dog of Alcibiades. It would be interesting to see the results for other mastiff-like breeds.